Prudent pre-harvest hedging reduces risk, particularly if it is done in conjunction with the purchase of revenue crop insurance having the Harvest Price Option (HPO) option. Recent criticism of crop insurance suggests that amendments could be placed in the farm bill to curtail HPO coverage. As a result, understanding farmers pre-harvest hedging activities is important at this time. A survey of Midwest farmers was conducted to understand how much pre-harvest hedging is done. Survey results indicate that farmers use what can be termed prudent hedging strategies prior to harvest for marketing their crops. The initial survey results also indicate that farmers would likely reduce pre-harvest hedging if HPO is eliminated. Hence, Congressional efforts to limit HPO would increase risks to farmers. Surprisingly little information exists concerning how farmers use pre-harvest marketing strategies such as forward contracting and futures contracting (generally referred to as pre-harvest hedging). As a result, a simply survey was developed that asked farmers about their pre-harvest hedging practices; an initial step in analyzing this risk management strategy and the crop insurance HPO issue. The survey was administered by the Illinois Corn Growers Association, and a number of state corn growers’ associations contacted their members to complete the electronic survey. A total of 194 survey responses were completed, with 70% of the responses coming from Illinois. The remaining surveys came from Indiana, Iowa, Kentucky, Missouri, Nebraska, North Dakota, Ohio, Oklahoma, Texas, and Wisconsin. The survey focused on the amount of 2018 corn production that was hedged prior to April 1, 2018. Respondents were instructed that pre-harvest hedging included the use of forward contracts and use of future contracts. Pursuant to a forward contract, a farmer agrees to deliver grain to a country elevator or processor at some point in the future, often near harvest time, but based on futures market prices at the time of the contract. This legally-binding contract locks in the price for the delivered grain as a hedge against lower prices at the time of delivery. While advantageous to the farmer in terms of protecting against lower prices, it also comes with risks that prices will increase, often as a result of lower yields for the crop nationally. In extreme situations, a farmer with significant yield losses may not have enough bushels to fulfill the contractual obligations and will need to purchase bushels to make delivery; bushels purchased in such a situation could well be at a higher price than the farmer contracted. HPO is designed to provide protection in those cases when yields are low and prices rise. HPO calculates guarantees based on the higher of the projected and harvest price. The “higher of” is the HPO feature, causing guarantees to increase when harvest prices are above projected prices. Common insurance products that include HPO are Revenue Protection (RP) and Area Revenue Protection (ARP), policies that are typically used on more than 90% of insured acres (farmdoc daily, May 8, 2018). Future contracts are conceptually similar to forward contracts. For the typical hedge, a farmer sells a futures contract at some point prior to harvest. To offset this hedge, a futures contract is purchased sometime in the future. In years in which widespread yield shortfalls occur, prices increase and farmers are purchasing futures contracts at higher prices. HPO, again, provides protection for these situations. 2% of the survey respondents indicated that over 75% hedged (see Table 1). An “average percent hedged” was calculated for the respondents based on their categorical responses. For example, 0% hedged was given to the 16% of respondents that indicated that no forward pricing had taken place. Those farmers responding that between 1 and 10% of their expected production hedged were weighted at 5.5% percent hedged, the midpoint of the 1 and 10% ranges. This process was repeated for all categories and a weighted score was calculated. For all respondents, 22% of 2018 expected production was hedged as of April 1. For those that did hedge, somewhere between 11% and 50% of expected production typically has been hedged. These amounts seem prudent. Farmers are not hedging a large amount of production as there still remains time to pre-harvest hedge and planting has not taken place. Moreover, acreages could be lower than expected if poor planting weather occurs. Furthermore, yield uncertainty is unresolved such that hedging large percentages of expected production could result in more grain priced than is actually produced. These hedging amounts are consistent with pricing at multiple times of the years and “spreading” sales. Off-farm sources are a very important and large source of family living funds. Off-farm income serves as a way of diversifying income. We expect that farmers who rely heavily on farming operations for family living will use other risk mitigating strategies to offset risk as off-farm income cannot be used to substitute for farm income. As a result, per-harvest hedging is expected to be higher for those farms primarily relying on farming for their family living expenses. 17% indicated that off-farm income was an important and large source of income. Overall, the percent of farms relying heavily on farm incomes for family living likely is higher in this survey than it likely would be in a random survey of farms. This is attributed to survey respondents being members in a corn growers association which implies a significant involvement in farming. As expected, farmers that more heavily rely on farm income used more pre-harvest hedging. Only 13% and 16% (respectively) of farms whose family living came solely or primarily from farm income had not used pre-harvest hedging by April 1, compared to 29% where off-farm incomes was a significant source of family living withdrawals (see Table 1). The average percent of 2018 production hedged was 21% and 23% (respectively) for farms whose family living came solely or primarily from farm income. The average percent hedged was lower, at 20%, for those farms where off-farm income was an important source of family living. 91% or more of farmland is rented — 30% of respondents. As expected, most of those surveyed had over 60% of the farmland in their operation rented. These values are fairly typical for commercial-sized grain farms as reported in Illinois Farm Business Farm Management. These percentages likely are higher than for a random survey of farmers. Overall, there is a noticeable difference between those with less than 60% rented farm base and those with above 60% rented. The percent hedged was 20% for “less than 30% of farmland rented” and 26% for “31% to 60% rented”, compared to 11% for both categories of “above 60% of the land rented” (see Table 1). Average percent hedged was 21% for the least rented farmland increasing slightly to 23% for over 60% rented. Overall, percent of farmland rented had impacts on pre-harvest hedging. One could speculate that risk increases with a higher proportion of farmland rented and that the additional risk could lead to more pre-harvest hedging. It is likely that the above results would be more pronounced with more refined measures of the riskiness of the farmland base. Additional items such as percent cash and share rented, costliness and fixity of cash rent levels, and length of tenure relationships are important in determining the riskiness of the farmland base. 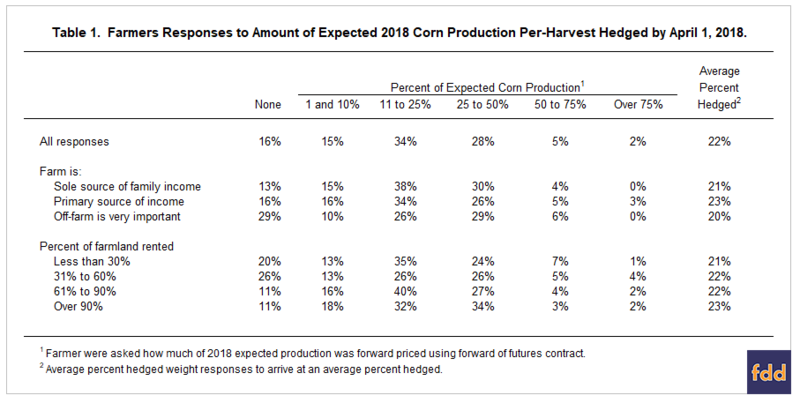 Respondents were asked how much of their expected production was typically priced by January 1 in the year of harvest, April 1, and July 1. As expected, pre-harvest pricing increases as harvest approaches (see Table 2). The percent of farmers that had not priced some corn went down over time: 29% by January 1, 16% by April 1, and 9% by July 1 (see Table 2). The average percent hedged went up: 10% by January 1, 22% by April 1, and 41% by July 1 (see Table 2). Farmers were also asked if the amount of 2018 corn production hedged by April 1 was typical. Of those that responded, 71% indicated that their 2018 expected production hedged was about the same as it usually was, 12% indicated less, and 17% indicated more. These responses suggest that values shown in Tables 1 and 2 are representative of a typical year. Survey respondents were asked if they took Revenue Protection (RP) or Area Risk Plan (ARP) insurance. Both of these insurance coverages have the harvest price option (HPO). Of the respondents, 91% of the respondents took RP or ARP insurance. This high percentage is as expected given the high use of RP (see farmdoc daily, May 8, 2018). Those farmers taking RP or ARP were asked if they knew that the policy they purchased included harvest price option (HPO) which allowed the guarantee to increase if the harvest price was above the projected price. Ninety-six percent indicated that they knew that their policy contained the HPO. Respondents who took RP or ARP were asked if they would reduce forward pricing if HPO did not exist. Fifty-three percent of respondents indicated that they would reduce pre-harvest hedging. Of the 53% that indicated that they would reduce hedging, 40% said they would reduce hedging up to a quarter, 42% indicated hedging would be reduced one-quarter to a half, 13% indicated that hedging would be reducing one-half to three-quarters, and 5% indicated that they would reduce hedging by over three quarters. Farmers make use of pre-harvest hedging strategies to help manage the price risk for their farms, and initial survey results indicate that HPO is an important consideration in that risk management decision. Eliminating HPO likely would result in lower amounts of pre-harvest hedging. Reducing subsidies associated with HPO likely would result in lower coverage levels, again leading to lower amounts of pre-harvest hedging (see farmdoc daily, May 11, 2018). Lower amounts of hedging likely would be more pronounced on those farms that rely more on the farm for their primary source of income and those that rent more of their farmland base. In other words, those impacted the most by this policy change (eliminating HPO) are those who most rely on farming for their family income. Schnitkey, G. "Overwhelming Use of Harvest Price Option Crop Insurances." farmdoc daily (8):83, Department of Agricultural and Consumer Economics, University of Illinois at Urbana-Champaign, May 8, 2018. Zulauf, C., J. Coppess, G. Schnitkey, and N. Paulson. "Premium Subsidy and Insured U.S. Acres: Differential Impact by Crop." farmdoc daily (8):86, Department of Agricultural and Consumer Economics, University of Illinois at Urbana-Champaign, May 11, 2018. Zulauf, C., G. Schnitkey, J. Coppess, and N. Paulson. "Premium Subsidy and Insured U.S. Acres." farmdoc daily (8):46, Department of Agricultural and Consumer Economics, University of Illinois at Urbana-Champaign, March 15, 2018. Schnitkey, G., J. Coppess, N. Paulson, and C. Zulauf. "Farm Sizes Impacted by a $40,000 Crop Insurance Premium Support Limit." farmdoc daily (8):19, Department of Agricultural and Consumer Economics, University of Illinois at Urbana-Champaign, February 6, 2018. Zulauf, C., G. Schnitkey, J. Coppess, and N. Paulson. "Crop Insurance per Acre Coverage: Historical Experience and Potential Issues." farmdoc daily (7):225, Department of Agricultural and Consumer Economics, University of Illinois at Urbana-Champaign, December 7, 2017.